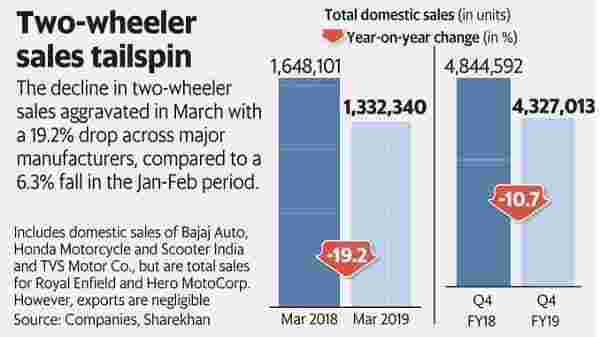 Hopes of demand recovery in two-wheelers crashed after manufacturers put up a dismal show in March. Worse, this warrants an earnings cut for FY19. It also paints a gloomy sales growth picture for FY20. Aggregate domestic sales for March of five leading auto manufacturers plunged 19% year-on-year. This was more than three times the drop in the January-February period. It also weighed on the quarter’s performance, with sales retracing by 11%. Hero MotoCorp. Ltd’s March sales dropped 20%. Honda Motorcycle and Scooter India Pvt. Ltd’s (HMSI) sales halved from the year-ago period. Even TVS Motor Co. Ltd and Royal Enfield saw sales fall 7% and 20%, respectively. The outlier in the pack, Bajaj Auto Ltd, however, posted 39% year-on-year increase in domestic sales during March, ending the quarter on an optimistic note with 22% growth. What’s worrying is that the green shoots of recovery are not visible. “Reports suggest that unemployment is at an all-time high, with the services sector severely hit. More than 60% of farm produce has been sold below the minimum support price, reprising rural distress,” said Yadvinder Singh Guleria, senior vice-president (sales and marketing), HMSI. As witnessed in the last decade, whenever two-wheeler demand stuttered, it soon gathered pace. This time around, manufacturers say that the first signs of a slowdown came with the Kerala floods. Later, higher insurance costs pushed up two-wheeler prices by 7-10%, hurting demand. Add to this, fuel price increases, lack of liquidity due to the debacle in non-banking financial companies (NBFCs), clipped sales even during peak seasons of Navaratri and Diwali. These headwinds kept sales at bay in the second half of FY19. Inventory levels by January-February soared to levels of 70-80 days. The sharp drop in March sales, therefore, signals production and dispatch cuts in order to rationalize inventory levels. Bleak prospects still stare at auto companies. According to an IIFL Holdings Ltd report, “Our checks with dealers and OEMs suggest that industry-level end-demand, which weakened in mid-FY19, persists. Discounts and promotional schemes are not helping improve volumes.” OEM stands for original equipment manufacturer. Even if demand picks up following positive triggers such as a good monsoon and the festival season, other challenges exist. Mandatory anti-lock braking system (ABS) and a combi-brake system (CBS) will lead to further price increases. Dealers are cautious regarding sales prospects, given customers have already seen price hikes of 10-15% between 2017 and 2018. The industry also has to face new BS-VI emission norms, effective April 2021. This will again see the need for clearing inventory of BS-IV vehicles. The consensus on the Street points to an earnings cut of 4-8% for both FY19 and FY20 across listed two-wheeler firms. “High inventory levels will keep discounts and promotional expenses elevated, which, along with negative operating leverage, will weigh on profit margins,” adds IIFL Holdings. No wonder shares of Hero MotoCorp., Eicher Motors Ltd, manufacturer of Royal Enfield motorcycles, and TVS Motor are down around 25% from a year ago. Shares of Bajaj Auto, too, were flat over a year, in spite of clocking an impressive sales growth due to its aggressive marketing strategy.